Home / Blog / How to improve your sales funnel and grow membership by giving something away for free. Grow your list by giving something away for free. One of the most popular growth models that you can adopt is to give away content, services, and/or products for free. We all know there’s no such thing as a free lunch, so in return you ask the user to share their contact details in order to access this free item. The idea is not based in tricking people into signing up, but rather to demonstrate that you have something truly valuable that they can use and benefit from now. It’s a way to introduce yourself to a potential customer without asking for payment right away. It’s a way to enrich someone’s life and create a relationship with a customer who may have otherwise overlooked your business. Essentially, any time you are deciding what content to distribute free of cost, it needs to be a strategic decision. You need to be thinking three steps ahead. Because by giving away something for free, you’re looking to create leverage that allows you to eventually do something for profit, right? Right. So figure out what kind of content will get you what you want, and who needs to see it for that to happen. After these customers have used and (ideally) enjoyed and benefited from whatever you gave them, then you can start to actually sell. Now is the time to share something else that customers can pay to see, use or experience. Because you have established trust, your users will be more likely to pay you for some of your premium content. Every user that joined as part of your “free” promotion is now part of a database that you can use to further interact with—even if it is much later on. This is the crux of how to grow your sales funnel using this model. It can seem counterintuitive to focus your efforts on a strategy that is not designed to get you paid. Picture this: you could spend a small fortune on advertising via social media, Google Adwords, and other platforms, adding you to the sea of ads constantly bombarding users for their attention (ads the average person has gotten really good at ignoring). Or, you could direct market to your personal list of thousands of existing (free) customers to let them know about your premium membership offering. If they liked your free stuff, they are going to simply LOVE your Premium goodies. People love getting free stuff. If it is free and valuable you can gain popularity quickly. It gets people using your service or product which should increase feedback—helping you make a better product or service. You can build an invaluable customer base full of customer contact details to use for ongoing promotion and marketing efforts. It makes marketing more successful because you’re talking to your own user base. It is a known fact that there’s a higher return on investment when marketing to existing customers. If you have built your own list of customers email addresses, you have complete control over how and when you interact with (market to) them. Remember to be considerate with your user’s data, taking care to provide choices for unsubscribing or modifying to hear from you and how frequently. Having access to all of these email addresses gives you great power…and we all know what comes with ‘great power’, don’t we? 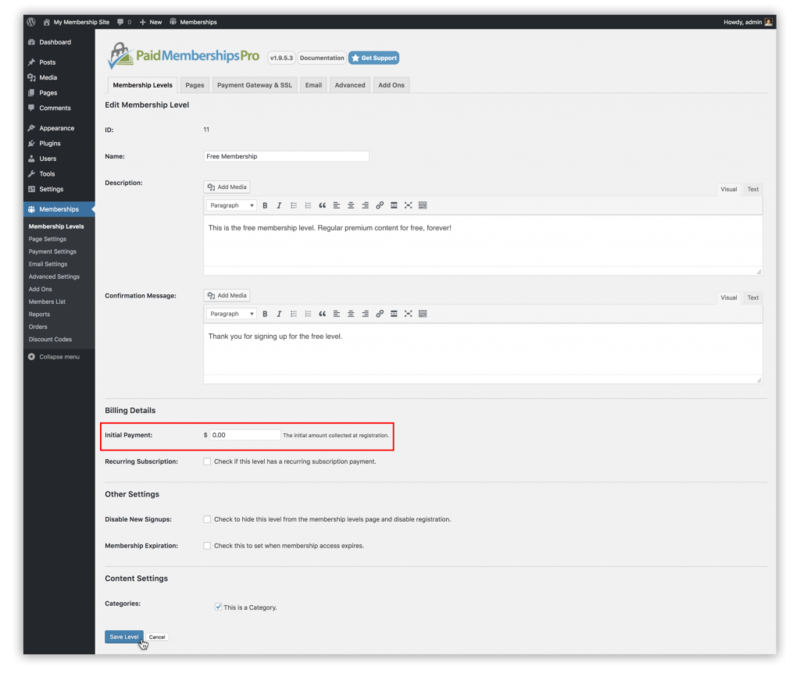 Let’s explore how to use Paid Memberships Pro to build your customer database. The same primary steps apply no matter what your “free” promotion is. We’ll also cover a few methods to deliver your “free” item in the steps below. Use Paid Memberships Pro to build your customer database. Create a Free Membership Level using Paid Memberships Pro and have some content linked to this free level that will help your members. Set up an email marketing platform that you can use to send out emails to those who sign up for your membership. We have an integration for a couple of them, for this article, I am using MailChimp as my example. 1. How to set up a Free Membership Level. Once you have Paid Memberships Pro is installed and activated, the next step is to set up a Membership Level. 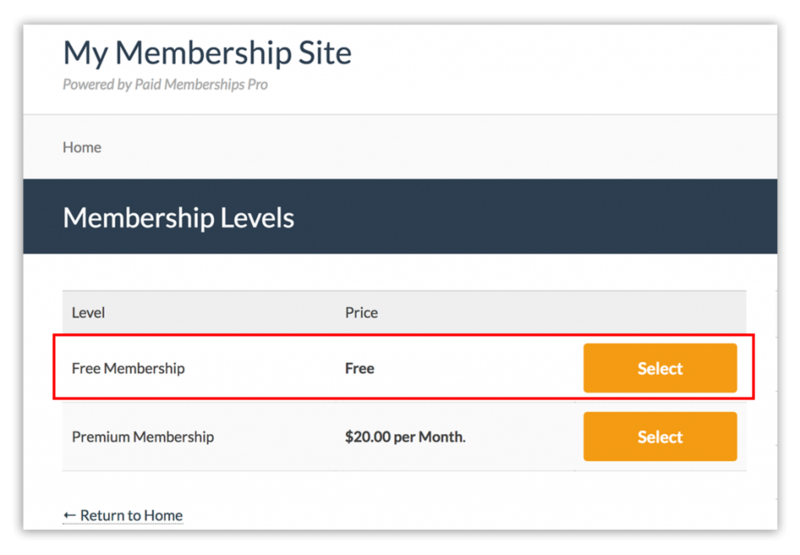 To do this head over to the “Memberships” tab that should now be accessible from your WordPress Dashboard and select the Membership Level option. Now, navigate to the top of the next page and select the “Add New Level” button. Give your membership level a name, description, confirmation message. Under the Billing Settings, make sure to leave it blank (it’s a free level). Save the level. Now you can now navigate to your “Membership Levels” page and view your Free Membership level. Note: If you are looking for more information on how to install, activate and set up Paid Memberships Pro, I would recommend taking a look at our Initial Setup Video, for a general walkthrough of plugin setup. If you haven’t already set up a MailChimp Account and need to do that you can get started here. I am not going to cover how to set up MailChimp in this article but there is an abundance of online resources to help you out with this. We have developed a MailChimp Integration Add On that allows you to add members to MailChimp lists depending on their membership level. The integration also merges in the user’s membership level as additional contact information. This allows you to segment your members by level and send specific marketing emails to each group. 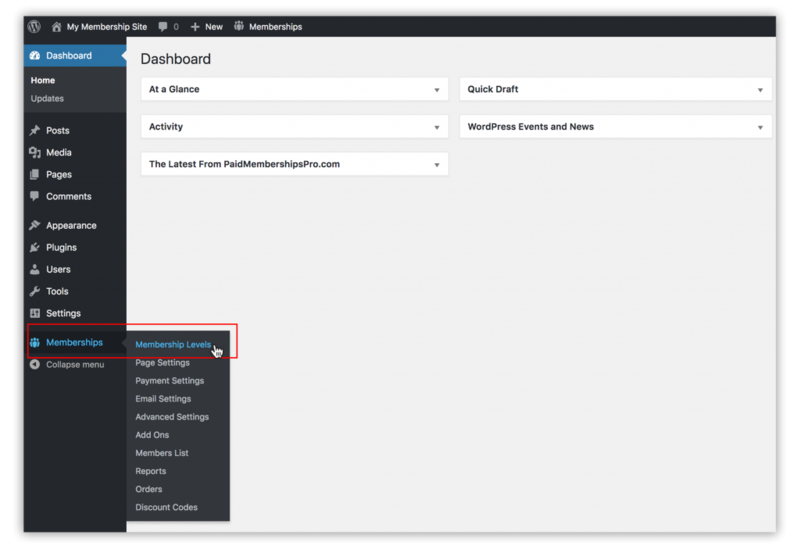 Navigate to the ‘PMPro MailChimp’ admin page in the WordPress dashboard Settings Menu (WP Dashboard > Settings > PMPro MailChimp) to configure your MailChimp API Key and Lists. 3. Add Free Members to MailChimp lists. 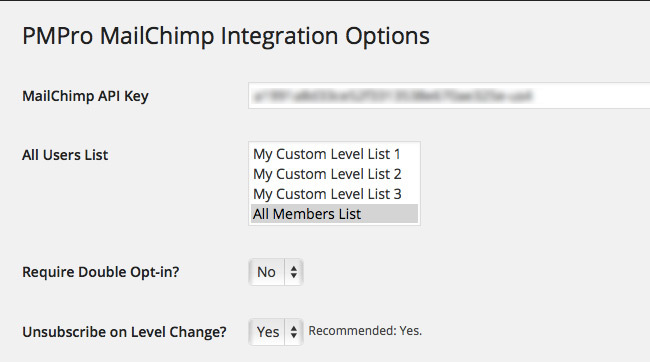 Once your API key is loaded into the integration options, you should see a list of MailChimp lists available in your account. 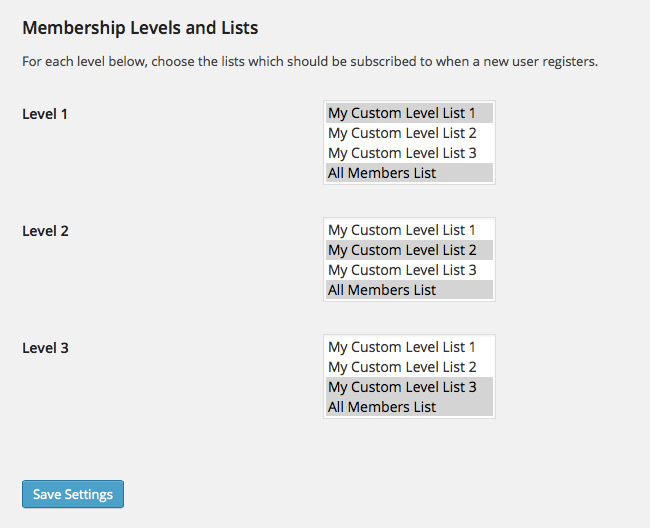 Select the appropriate lists for members based on their level. If you need to create a new list you must do so in your MailChimp account dashboard. With this integration, you can also offer “Double Opt-ins” for members. This is especially important for customer in Europe focused on recent GDPR laws that are now in place. Remember that in addition to assigning members to lists based on level, you can also segment users directly in your MailChimp account based on our default contact merge fields for a user’s membership level. This is sometimes a better approach because MailChimp will charge you double for a subscriber that is on two separate lists. 4. How to deliver your “free” content to your members. It is important to make it easy for free members to access the content they were promised. Here are a couple of ways you can make it nice and simple for your members to get their hands on the free content you are offering them. Set up a “welcome” autoresponder email for all new member signups in your email marketing program with a link to read your eBook. You can also include a couple of other useful links pointing to different parts of your site. Just be sure to make it easy for your members to see and download the eBook as this is the main reason for them signing up. When a new user signs up add a link to view your instructional video to your level’s confirmation message and on the membership account page. Set up a service like Calendly and share a link for members to create an appointment to chat. Use our Download Monitor Integration to offer members-only downloads of eBooks or other content. The way you deliver the promised “free” content will vary based on what you’re giving away (surprise!). If you have a specific type of item and would like some feedback on how to deliver it, please post a comment below. Have you already built an amazing ‘freemium’ business and have some tips and tricks? If there’s something you feel I missed in this article, please share in the comments below. I would love to see what you are building and how you are using Paid Memberships Pro to #GetPaid. ← Reformat usernames to use allowed characters after checkout.